It always seems like such a relief when November 1st rolls around. I am not a fan of Halloween, but I force myself into the spirit of it when the last week of October rolls around, and I feel the pressure to get some Halloween costumes put together, and buy a pumpkin. Because really, it's all about the free candy, and by the end of October I could really go a good 100 Grand and Baby Ruth. By now my kids know that they are not allowed to have individuality when it comes to costumes. They have become accepting of the mandatory group theme. This year they were super cooperative and really awesome for putting up with me. 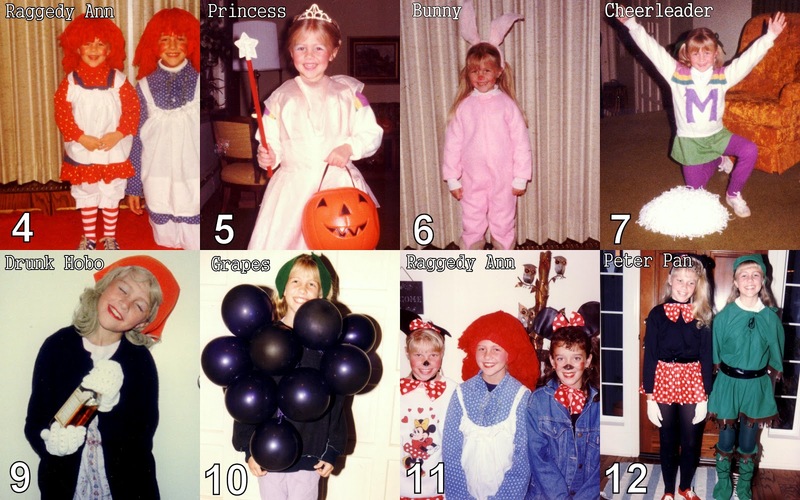 The inspiration for the group theme costume came from a Google image search for "group theme costume". This one caught my eye and I made some modifications and improvements to make it appropriate for children. I think ours turned out better, but that is just my biased opinion. 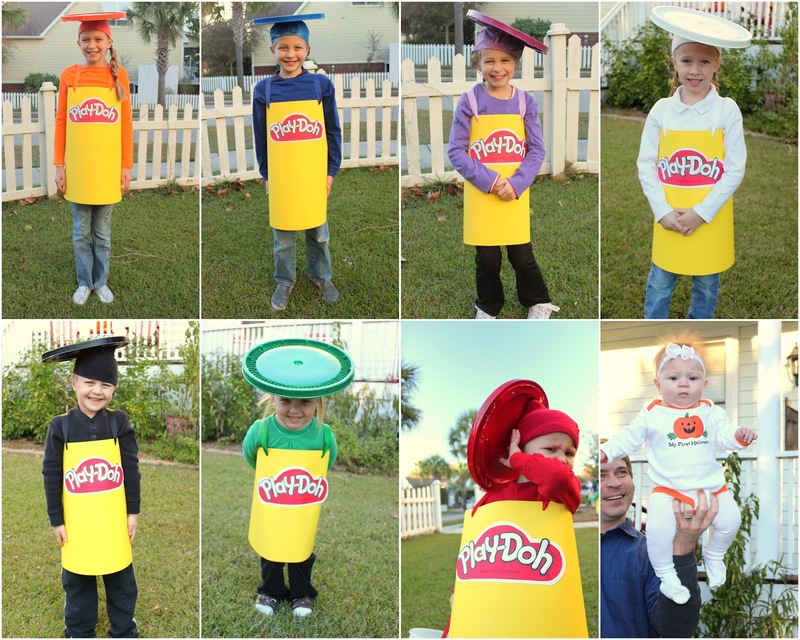 The Play-Doh color was chosen according to what solid color long-sleeved shirts I had in each kid's size. I had to buy the purple and blue one at Goodwill for $2.70 each. I found the Play-Doh Logo doing a Google Image search and printed it out on red paper, again on white paper, and a third time on white paper. For art class one day we cut out the words and glued them onto the red paper, and then we glued the red paper onto the white paper. All that work is definitely not necessary if you have a color printer, but I don't have one, and I don't think I would even be willing to sacrifice all that red ink or toner for Halloween. It went pretty fast with some teamwork. You can see the yellow container was just a piece of yellow posterboard I bought for $0.25 each at Hobby Lobby. They happened to be on sale the week I bought them. I punched holes in the front and back and criss-crossed grosgrain ribbon that matched their shirts. I already had the ribbon because at one time I bought a whole bunch to make bows for my girls hair but never did. So sometimes it pays off to not follow through with a project. I tied knots to keep the ribbon from slipping through the holes. For the lids, I had some old bucket lids stored in my garage. I knew I've been keeping them in there for a good reason for the past 6 years. However, I did see bucket lids at Walmart for $1.17, so it's still rather inexpensive if you don't have a supply of bucket lids. I spray painted them a color. For blue and purple I bought two cheap painter's hats at Hobby Lobby for $0.99 each, I hot glued them to the lid, and spray painted them as well. The spray paint was the most expensive part of the costume at $4.34 a can, but it didn't bother me to spend the money because there is paint left over, and I'm sure I will use it on another project someday, perhaps our homemade Christmas gifts. For orange, black, white, green, and red I used old pairs of cotton girls tights. I cut off the legs and glued the crotch part to the lid. The tights worked better because they fit tighter around their heads. Wendy said hers was too tight, but she is also known for being a little dramatic. You could also probably use old kids underwear, but I know there aren't any old pairs of underwear in my house that I would be willing to wear on my head. I knew we ate ice cream by the bucket for a reason. I can never get myself to recycle these when we finish one, so I have a stack of them in my garage. I color coded them with matching ribbon because my wisdom spoke to me and predicted there would be mix-ups and arguing at some point during the night. Heidi did't participate in the Play-Doh, but she posed nicely for me. It looks like she's doing the snake. While we were trick or treating, Bradley turned to me and said, "Mommy, next year can we be something that is at least just a little bit evil?" Haha! That made me laugh and still does. I thought Play-Doh was evil! Now for a fun little Blast to the Past. Our kids always ask us at dinner to tell them a story about when we were little. This month I tried to remember Halloween stories to tell them. Today I went through my old photos and made this collage to show them. The number is my age. I don't know why I'm mising age 8. Either I didn't go trick or treating or we failed to get a picture. Perhaps the film got exposed, or the picture was so bad it didn't make it into the photo album. Huh? Yeah, remember when you couldn't take a billion pictures until you got the perfect shot? You snapped a picture, hoped you didn't blink and got the results a week or two later? I appreciate digital photography and editing a whole lot! We had some friends visit us Monday and Tuesday. Whenever I set Heidi down to her counterpart boy baby, she couldn't keep her hands off of him. Even if it was just the tip of her finger. And notice Heid's new hair do? I hear baby boys dig the Pebbles style. Heidi is also robbing the cradle. Little Dax is 3 weeks younger than her. I'm not sure when most kids learn to ride a bike without training wheels. I think Emily was about 6, Bradley was 5, and Sarah was about 6 or 7. I was just super excited that Wendy was finally willing to try it today at age 7. 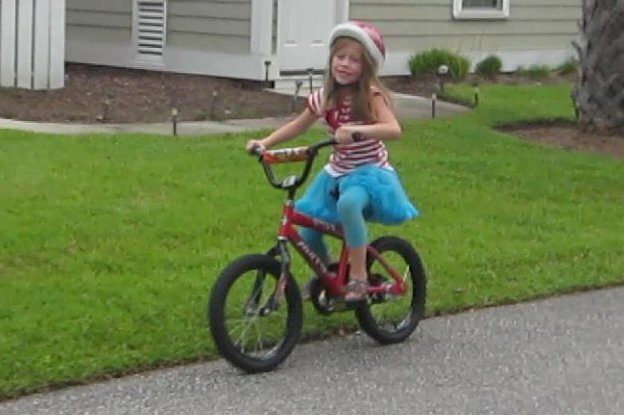 I don't know if it was the boy's bike or the tutu that helped, but she got the job done. I have to give myself some credit too because I was the one running along side her in my flip flops on one of the most humid days ever! And sorry for such a poor quality photo. I put Emily in charge of photography and she thought I meant videography, so I had to take a snapshot, using Google Picasa, from the video, which is why it's all weird and looking like I used a 1 megapixel digital camera from 1999. This isn't one of Heidi's most photogenic shots, but.....look who's smiling! It warms a heart. It's a sad day when your baby exceeds your postal scale's 11 pound weight limit. It began on Monday morning, June 25th. I woke for my daily tiny-pregnant-bladder morning bathroom trip at 6:30 am. I was alarmed to see blood....in my underwear. I knew it wasn’t a good sign, and so I panicked. I woke up my husband and told him what was going on. My husband called the doctor and the doctor said, “No more monkeys jump.....” Actually the doctor said it would probably be best to head to the hospital be checked and monitored. So that is what we did. I was so relieved to hear the baby’s heartbeat once they hooked me up to the monitors. 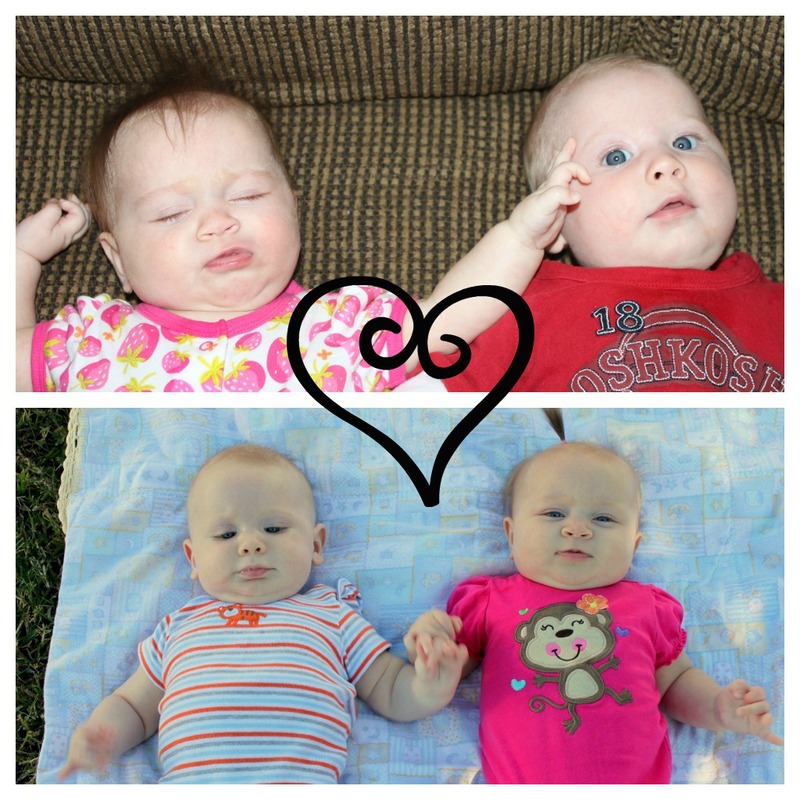 My fears were calmed, but I still wondered what they would do since I was 38 weeks and 3 days. My regular doctor came in and examined me. He wasn’t sure what was causing the bleeding, but he concluded that it was related to cervical change and nothing to be worried about. He sent me home, told me to call if I had any further problems. He also suggested that I think about being induced on Friday, when I officially hit 39 weeks. Thankfully, I had no further major bleeding that day. The following day I had my regularly scheduled doctor’s appointment in the morning. My status was the same as the previous morning. I was about 2 cm, the baby was still high, and labor did not seem imminent. Thursday I woke up at about 5:10 am to go to the bathroom and again there was blood. It was a menstrual flow amount of blood. I didn’t panic because of my Monday experience, and therefore I didn’t call the doctor right away. I sat on my bed hoping to feel baby move. It seemed like it took FOREVER to feel her move, and when I thought I did, it was so subtle that I second guessed that I actually felt it. I decided to call the doctor. The on-call doctor seemed to think it would be fine to wait until the office opened at 8:30 am. I agreed, but I wanted to be more confident that baby was moving. I went downstairs and drank some juice to help wake her. She had never been a very active fetus in the morning, and I often waited at least a half hour every morning to feel some movement, so it wasn’t unusual. After some more subtle movement, I called my regular doctor. He had given me his personal cell phone number at my appointment the previous week so he would be sure to deliver baby number eight, since he hadn’t delivered ANY of my previous seven babies. He told me to meet him at the office at 8:15 am. He was scheduled to work in a different office across town that day, so he was going to check me at the office nearest the hospital before he headed to the office across town. My husband and I got ourselves showered and ready. While getting ready, I had a few minor contractions, so we decided to head toward the doctor’s office a little early and sit in the parking lot in case labor was beginning. My dad was home to watch the kids.On the way, I got a phone call from my doctor. He changed his mind and told me to go to the hospital instead of the office. I don’t know what changed his mind, but we obeyed. We arrived at the hospital at 7:30 am. I had my husband take a picture of my pregnant belly just in case I was admitted and had the baby that day. I really had no idea what to expect. I half expected to be sent home and half expected to have a baby. I was ok either way. I really wanted her to be born the following day, on the 29th, so our family would have three consecutive birthdays in a row (baby on the 29th, mine on the 30th, and Wendy’s on the 1st.) But since bleeding was a concern, I was willing to accept her a day early if it ensured our health and safety. Again I was relieved to hear the baby’s heartbeat when they hooked me up to the monitors. However, her heartbeat seemed to be faster than it was Monday. On Monday it remained stable in the 150 bpm range. On Thursday it was hovering in the 170’s. I inquired about it and the nurse said I was probably dehydrated, so she hooked me up to an IV. Sure enough the heart rate went down to the 150’s once I had my fluids. My doctor came and examined me at about 8:15 am. He said he didn’t know for sure what was causing the bleeding. He measured me at a “ballooning” 3 cm, which meant that the baby’s head was putting pressure on my cervix and making it bulge. He advised that I be induced that day. He said that it wasn’t worth the risk of the bleeding being an issue with the placenta and having an emergency situation later that weekend. I agreed. So the plan was that my doctor was going to come back at 11:00 am to break my water and get the party started. I was extremely nervous about the whole situation. I had a pile of wadded tissues on my hospital tray table from all the crying. I had also never been induced before, and did not know what to expect. I always have a fear of dying in childbirth, especially since I had a bleeding episode after the birth of George two years ago. So I was especially fearful going into a birth already bleeding. It just didn’t seem like a good situation. I decided to write in my journal and let my kids know I loved them and express my testimony that I know Jesus Christ is my Savior. I told them in my journal that I would see them again someday. It was such a morbid journal entry, but I didn’t want to depart from this Earth with any regrets. My doctor was running a little bit late and he arrived at about 11:40 just as a I was addressing my future grandchildren in my journal. He didn’t miss a beat when he walked in, sat on the bed and opened his medical device that looked like a giant plastic crochet hook to break my water. I’ve had my water broken before while in labor, but this was the first time I had it broken before contractions started. I had no idea what the outcome would be, except that I was committed to having the baby within the next 24 hours. He jabbed around for a while. It was extremely uncomfortable. He was having a difficult time breaking it because her head was pressed up against my cervix so tightly, creating no good spot to pop it. But finally after a few minutes of poking and prodding, it slowly began to leak. All that poking and prodding with the giant crochet hook gave little Heidi some war wounds on back of her head. She survived. And, yes, she has a lot of hair. It's kind of weird. After the water was broken, the baby’s heart rate dropped. The nurse told me to roll on my right side and she gave me an oxygen mask. It kind of freaked me out, but nobody was in a panic so I remained calm. I couldn’t see the heart rate, but I could hear it pa-booming more slowly than before, and the doctor was watching it constantly. The nurse told me it was normal for a baby’s heart rate to change when their environment changes. I chose to believe her. Finally, when baby's heart rate was back to normal in about 5 minutes they hooked me up to pitocin to help trigger contractions. The nurse said the pitocin usually takes about 30 minutes to kick in. As she was hooking it up she informed me that the anesthesiologist was in a C-section at the moment, so if I wanted an epidural it would be at least an hour before I could get one. It made me laugh that they were telling me this after the fact, but I took a deep breath and said, “Ok! I can do this!” I wasn’t planning to have an epidural, but it would’ve been nice to have had the option. Rumor has it that pitocin makes contractions more intense than natural contractions. I asked if it was even necessary to get the pitocin, but my doctor assured me that the dosage was so low, it should not adversely affect labor. He said that we breathe in more pitocin than the amount that was being administered through the IV. I actually believed him for a moment, but I’m pretty sure he was kidding. The doctor left the room because he said a watched pot doesn’t boil. I had him assure me that he wasn’t leaving the hospital, and he said he would be a moment’s notice away. He ended up sitting in the physicians’ lounge watching the news, possibly lamenting the announcement of the Supreme Court’s ruling in favor of Obamacare earlier that morning. About five or ten minutes later my contractions started. They weren’t extremely painful, but enough where I had to stop and breathe during them. I managed to take this picture with my iTouch in between contractions and post it to Facebook. 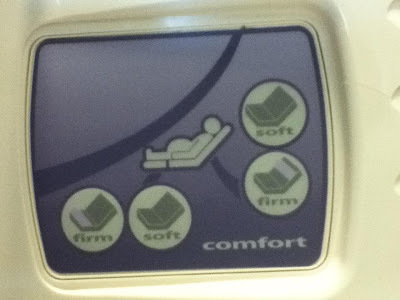 It made me laugh because I don’t believe there is such thing as comfort when it comes to labor and delivery. The picture was comical too. The contractions became regular at about 3 minutes apart. Since they came so soon, they were likely naturally occurring from my water breaking. At this point I had no idea how long they would last before delivery. I was kind of expecting a 2-3 hours because I was only about 4 cm when they began. I had a lot of pressure on my bladder, so I decided to go to the bathroom before the contractions intensified. When I got back to my bed I had a very intense contraction and they continued to intensify, still at about 3 minutes apart. I told the nurse she was not to leave the room and she kindly obliged. She told me to tell her if I was beginning to feel pressure. I couldn’t tell for sure if I was feeling pressure, and I didn’t want to be the woman in labor who cried wolf. I decided to tell her that I was feeling slight pressure so that she would feel an urgency to call the doctor. She did a cervical check and said I was about 8 cm. About 3 minutes later I had another extremely intense contraction. Usually I can just breath through them, but this one was intense enough where I couldn’t help but moan and verbalize my pain. (No bad words, just more volume to the moaning and breathing.) When that one was over I made sure the nurse was getting the doctor. I was relieved to see him walk into the room wearing his scrubs as I breathed heavily through the pain of the next contraction. The nurse immediately began to help him get on his baby catching gear. While she was tying his robe thingy and he putting on his gloves, I could painfully feel a head crowning. The nurse and doctor did not seem to be ready and I was getting nervous that the baby would pop out and fall on the floor. Now picture a pregnant woman thrashing her legs back and forth on a hospital bed while tightly holding onto the bedrails, her head thrown back as she screams, breathing in through the nose and out through the mouth almost to the point of hyperventilation. Then picture more shouting of the above phrase, “IT HUUUUURTS!!! SHE’S COOOOMING! !” That was me. I would love to have a video of the action, but I’ll have to be content with the vivid memory, and you will just have to use your imagination. My husband knew to take me seriously. I think my doctor thought maybe he should take me seriously, so he peeked between my legs, saw a head full of hair trying to make her way out, and he said, “She sure is!” which gave a boost of motivation for the doctor and nurse to pick up the pace. My doctor instructed me not to push. In response to my doctor’s instruction not to push, my husband laughed and said, “Yeah, right!” My husband later related to me how he just wanted to bust up in laughter at the whole situation. I mean he felt bad that I was in so much pain and being told not to push when it was clearly time to push, but he said watching the nurse and doctor scramble to get ready to deliver a baby, knowing that time was against them, was very funny. Finally my body decided to take over, disobey all doctor’s orders, and do the pushing for me. I no longer had control over the contents of my uterus, and a baby head popped out. The doctor must have seen it happen from his peripheral vision, so he turned 90 degrees and reached between my legs to catch a baby and guide her out safely at 12:38 pm onto the foot of the hospital bed. She was born about 55 minutes after my doctor broke my water. Apparently, my pot doesn’t take long to boil. Baby immediately began crying and I received much relief from both pain and nervousness. I was so excited to have baby here safely, and I was slightly shocked that the anticipation of her arrival was over so quickly. Oh....and that rumor about pitocin making contractions more intense is not a rumor. It's totally true. They set the gooey baby on my abdomen while my husband cut the umbilical cord. I thought they would leave her there for a bit longer but they whisked her off to the baby heater thingy to wipe her off and do all they do to a newborn. I was kind of thinking, “Aww. I want to hold her for a little longer.” But at the same time it didn’t bother me that they took her to wipe off the goo before I held her. This may sound weird, but one of my favorite parts of childbirth is sitting in the bed with my legs spread eagle while the doctor delivers the placenta and my husband stands by the crib snapping pictures of the new baby. I think I like it because there is an immense feeling of physical relief after the baby comes out, and a secondary feeling of physical relief after the placenta comes out. It’s also a rare moment in life when I have no other option than to just sit and observe the moment while a team of other people do all the work and photography. I'll be the first to admit that Heidi is not one of my more attractive newborns. But I'm ok with that. Wendy wasn't either, and she has turned out to be quite beautiful. I'll be patient for Heidi's beauty to evolve. Seriously look at those nostrils! I think she had her nose pressed against my pelvic bone which flattened her nose into a funky shape. At least that is what I would like to think. You can poke fun. I did. ....I am happy to report that at 6 weeks old Heidi is beginning to grow into her nostrils, and she's getting cuter. Heidi's first birthday cake. I love birthday parties! Another benefit of being induced on the June 28th was that it ensured that I would have a June baby. All of my children have birthdays in a different month. Only Heidi and me have to share a month. There are still openings in March, August, September, and December. I just wanted my blog world to know that Heidi Johanna was born! Our first family photo with Heidi. We are very excited. However, reality hit today when my milk came in, the postpartum hormonal headaches began, and I changed several newborn poopy diapers. That stuff just seems to constantly ooze out of her! We came home yesterday, June 30th, from the hospital. It was my 36th birthday. I would have to say it was a great birthday present to bring home! Wendy's seventh birthday. Sarah baked, frosted, and decorated her cake. It's Funfetti with cream cheese frosting. It was a great day for Wendy! Now we get a 2 day break as we wait and prepare to celebrate America's birthday on the 4th.